When I interviewed David Tennant back in the summer, he said he was excited by the challenge, in these final movies of getting to "take this immutable character to mutable places." The Doctor's fear of his impending death - with or without regeneration(*) - gave Tennant some of the best material he's had to play in his run on the series, and the scenes dealing with that fear were the highlights of "The End of Time" Part 1. Watching him in the cafe with Wilf, you understood just how much The Doctor enjoyed being this particular aspect - and also how much Tennant had enjoyed this role of a lifetime. I agree that it was rather too busy. Also turning the Master into a kind of X-man seemed somewhat unneccesary - I'm not really sure what was added to the story by having him jump around instead of walking. That said, I really enjoyed Simm's interactions with Tennant (although the whole 'Master Race' thing overused Simm somewhat) and it's not often you get to see two of the best British actors of their generation on screen together, so I am very thankful for that! Here's hoping for a good resolution! It would break my heart a little bit to have Tennant go out on a sub-par story. Been watching since Tom Baker as I recall often the bad guy of the week rotated between The Master and the Daleks. For me it wasn't so much John Simms as I found the extra FX distracting. As foe BBCA ads, all I can say is there's a reason even with the smaller 24 hour delay that many people still seek out the UK version to watch. Having caught the UK version, since Space won't play the whole thing until next week and I didn't want to wait, I really don't think the problems with this episode have anything to do with the version of the episode. This one was all over the place and I was disappointed because while I expect the second part of the finale to be a let down, usually the first part is very good. The Ten/Wilf scenes were good, along with the quieter moments of the Master and Ten. From the little we saw of the Time Lords, they seemed intriguing as well (and the two people covering their faces behind Dalton have really piqued my curiosity). However, the Master gorging himself on food and bouncing around like Tigger was just ridiculous. Where did these superpowers come from? The father/daughter stuff was also weird, and I can't figure out why RTD used Obama and not a nameless president or prime minister as he has in the past. And it was exceedingly lazy to not check whether or not the US president gives important policy speeches on Christmas Day. This was jarring and pulled me out of whatever drama RTD was trying to create. I also was not impressed with the secret Saxon resurrection club that has apparently existed for years but that was never mentioned in the last few specials. At this point, Waters of Mars was a far better episode, although I hope that Wilf and the Time Lords can improve Tennant's last episode. A disclaimer: I'm a complete newbie to Doctor Who, besides the general information I know from it's place in pop culture. But, I was intrigued with the end of Tennant's run and decided to watch. there was way too much Bwaa-haa-haaing from John Simm. I was ready for him to get off the screen most of the time. His most enjoyable moments were the ones where he looked insane versus acting insane. As a complete novice, I wasn't completely lost. I thought they did a good job of making the series understandable to people coming to it for the first (almost) time. I loved the interaction with Wilf. Other than that...not much. I felt like there was a lot of running around and bwa-haa-haaing versus story. But, it was a decent set up for next week. I have no idea what to expect, except for the planned regeneration, and am looking forward to the ride. The Naismith father/daughter could have used a lot better set-up, as could the "immortality gateway." They seemed wedged in, and only necessary so far as their gateway enabled the Master to do what he wanted to do to freak out the Doctor. Still not sure what the green aliens were doing there, either. But the scene in the coffee shop with the Doctor and Wilf was enough to make up for all the rest as far as I was concerned. When David Tennant loses it, so do I. I was a hot wet mess by the end of that scene. Also: Timothy freakin' DALTON? Oh JOY! About Obama: I, too, found that so weird. But in the "Inside Look" that screened afterwards, RTD said that the Obama election had been so huge and such a beacon of hope that he felt he couldn't not address it. I didn't find the Christmas Day policy address as strange as the constant referrals to Obama's magic ability to fix the economy. It just seemed a little naive for a writer who has been so abidingly cynical about politics and politicians. hard to make conclusions about the first half of the end, but I agree with pretty much everyone that this felt disjointed and lacking of what you'd expect of a Tennant/Davies Doctor Who. Still have hope for the next installment, but it will be interesting to see if years from now critics will wonder if it would have been better for Tennant to end his run with Stolen Earth and Journey's End rather than these last two. And as for Karen's point about the constant Obama/recession references, I too found it odd. I figured it was Davies sarcastic way of showing how simplistic people are about the economy and how the world works. "Oh great, I don't have to do anything. There's a magic potion coming that will fix everything". Actually MyFawny the idea that the bad guy of the week rotated between the Dalek's, The Master and The Cybermen is a misnomer. It seems that way because those are the ones that stick out most to us, but by the numbers, of the 202 Doctor Who serials, only 26 have ever featured the Dalek's, and of that, 9 (over 1/3rd) have been in the new series. The Daleks actually had many long stretches where they didn't appear at all. During the 7 years Tom Baker was the Doctor, there were only two Dalek stories, the first year's "Genesis of the Daleks" and then not again until Baker's fifth season premiere episode "Destiny of the Daleks." The same is true for the Master. He only appeared twice during the Baker years, first in The Deadly Assassin and then not again until the final episodes of Baker's run in arc that was Keeper of Traken, Logopolis and Castrovalva. In fact of his 23 episodes, 6 have been in 3 story arcs, so outside of that he was only in 17 stories of 196. And the Five Doctor's special used both The Daleks and The Master, but neither was really the focus of the show. Almost all of those were during the Third Doctor's run, because they liked using Roger Delgado so much. I loathed every single second of this episode and found it a relentlessly insulting turd. I can't imagine a second draft was ever written of the script. The magic replicative donut was only tossed in after a lot of running about. The pathetic "President Obama will magically end the recession on Christmas" thing was ignorant to the point of being harmful. Everything to do with the Master was a mess -- his resurrection, the attack on his resurrection, his botched self after the resurrection, his Hungry Mungry self, his Skeleton blastoff powers, his short-sighted Shaquille O'Neal Malkovich Malkovich plan, Simm's performance. Everything to do with Wilfred was contrived and cloying. And Tennant was hardly used, had one single goofy moment with the Ood, one weepy bit in that diner, and then ran around and/or popped up in places a lot. Quite clearly, nothing ever mattered at any single point ever who cares bah. If the point of this episode was to make me wish Tennant and Davies gone, than mission accomplished. I want everyone involved with this "special" to die in a fiery bus crash. I went and counted it, and the Master was in 8 of the 15 episodes from his first appearance until Delgado's death three years later. So take out those three years, that 8 of his appearances, then the 6 from Baker end and RTD's third season, these two episodes airing right now, that's 16 of his 23 appearances right there. So really that is only 7 more appearances in 186 episodes. Indeed, pretty dire stuff that was as overstuffed and nonsensical as most of the RTD finale's/specials. I think RTD's like a British shoestring version of George Lucas - he needed a few less "yes men" around him. I trust Steven Moffat's instincts a lot more, but I would actually love to see TWO people run Doctor Who. The UK model of creating TV on this scale becomes too much of a singular vision, and if you don't LIKE that vision... you're in for a rocky few years. I thought it was too disjointed too, (although it seemed a little less so on the second viewing). But what was the point of the wife having a double secret formula that didn't work in time? That whole plot point seemed particularly clunky. Similar issue with the Obama thing. It's like Davies wanted an iconic 'man of the year' reference, but he didn't care enough to work it in a way that makes some sense with the real world. The scenes with Wilf were the only authentic moments. Almost felt like someone else had written them . . . I'm neven been a fan of RTD, since he threw out all the mythology of the show when he started, and now I know why he did. He doesn't know any of it. This was like a really bad HEROES episode. WTF?! Some many questions, no answers. What a mess. Goodbye Tennant, and good riddance to RTD may he never darken the Doctor's door again. I really don't understand why people are being so hateful. If you didn't like the show, fine, but it's completely unnecessary to wish that the writers and actors die in a fiery bus crash. I know that elsewhere in the internet, message boards are just a tool for people to anonymously express their rage, but this blog's commenters should be better than that. And I will only say this about the episode -- it is a big (bleeping) deal that the Time Lords are alive. How many episodic narratives do you need about changing timelines to understand that this is the core of both the Doctor and 'Doctor Who'? Even if the episode or characters were cloying at times, that cliffhanger was phenomenal. Other than that, as admirable the effort was to do the whole Malkovich bit, I was really underwhelmed with how the Master came back (especially now with special powers! The reason why the Master was interesting was he was every bit the equal (but opposite) of the Doctor - and I think the whole zapping bits and jump scenes really took away from that point). This episode just felt like a bunch of exposition and setups, so as a standalone episode, it doesn't hold. As a part, well, it completely depends on how part 2 goes. So, we'll see soon enough! Oh, and I can't say I wasn't at least a bit excited seeing the Time Lord quorum! That was pretty damn cool. Warning: as the end credits mentioned, the mysterious woman was played by the well-known actress Claire Bloom. If you should Google her to remind yourself of her credits, the second result on the Google page itself, in the tiny context excerpt from the target page, gives her surprise away from next week...although it seems that the Brits have already been spoiled about it. Interesting tidbit about the Daleks & The Master. The only other thing I missed is the Bridgadier himself. I thought that the frequent Obama mentions were odd. I get that the episode was probably written around the time of the election, but the way it's included in the show it was hard to tell if it was meant as praise or sarcasm. As for the reappearance of the Time Lords, I get that it's a big deal. Then again we knew time was being mucked about with when we saw Harriet Smith and the Ood were able to call the Doctor. My (obvious) prediction is that once time is corrected the Time Lords will go back to being dead and we'll get a new lonely Doctor. I thought that I would share what I have read on another board. It would explain why Wilf seemed to find the Doctor a bit easier than others and his being drawn to that church with the phone box in the glass. Since RTD hasn't been very subtle lately, it wouldn't surprise me if he used the John Smith concept again. I was extremely disappointed by the episode. The first 20 minutes were pretty much terrible (especially the Master's resurrection), it became interesting with some pretty good material in the middle (with the scene at the cafe a particular highlight, offering a nice reflection of the fact that regeneration is not just an easy way to carry on living, that the Tenth Doctor really does die) and then awful at the end. One of the many things that annoyed me was the fact that the Master really had no plan. He was just running around scrapyards eating until someone picked him up, stuck him in front of a machine, and he thinks "That's convenient, I'll use that". There's no sense of someone having a master plan that the Doctor interupts, it's just a bunch of random events that add up to a bad situation, and it's not satisfying to watch. I actually find myself almost not wanting to watch next week's episode - I will watch it, because it's Doctor Who, and because I want to see the return of the Time Lords, but I know I'll be disappointed. I really do think this is the worst episode of New Who - even my previous most-hated episode, Love And Monsters, at least had an interesting idea at its core, but this was just a mess. Davies can produce, and deserves at least some of the overly lavish acclaim he's received for reviving Doctor Who. But his writing is uniformly abysmal. I know Doctor Who has always been aimed principally at children (I loved it as a kid), but that's not an excuse for the awkward childishness of so much of Davies' writing. His attempts at sly commentary just fall flat and appear ridiculous. The bright light on the horizon is Steven Moffat, author of the superb 'Blink' episode from series 3. I've got a theory as to why the Master was always hearing drums, but I'll hold off saying what it is to avoid any spoiler connotation. If the whole of the Time Lord race has been hiding in the Master's cochlear implant, it might be worth tuning in to watch them march on out. And should I be excited about the return of the Time Lords? As much as I should be excited about the whole reasons for the Doctor's guilt and loneliness to be wiped clean, as much as I was excited that all the Daleks were dead except for one, except for four more, except for all of them. As much as I was that Rose was gone and then oh no she wasn't and then she got her very own Doctor. At the top of this episode I was thinking that, maybe, the fast-evolving Ood might become a new race of Time Lords. Something new and potentially interesting, instead of something desperately excavated. What happened to that promising dark omnipotence the Doctor displayed at the end of "Waters of Mars?" Oh, between episodes, the Doctor decided that wasn't such a good idea. What a waste this whole final run has been. About Obama: I, too, found that so weird. Not so much if you remember this: It was all filmed back in March, and without wanting to derail this thread into politics that will attract a slap-down from Alan, I don't think RTD was the only person in the grips of severe Obama Over-Excitement Syndrome. It is jarring though, considering that he previously had an entirely fictitious (if obviously Bush-ish) American President assassinated by The Toclafane, and in this show British Prime Ministers tend to have very short life expectancies. 1) I don't generally find the first halves of the big series-ending two-parters work that well on their own, and don't think they're supposed to. 2) The show is broadcast in the early evening and is supposed to be reasonably family-friendly. Not really intended for The Master to be skulking around and creeping everyone out like Brother Cavil on BSG. 3) And would be out of order to say that expectations are so high that RTD couldn't hope to satisfy anyone? Really. And should I be excited about the return of the Time Lords? Oh yes you should... because it looks like there is something worse than The Master out there. If you thought The Doctor in "Time Lord Triumphant" mode was downright scary, what do you think a whole race of them ready to do anything to escape their doom would be like? I was very disapointed. How many times do I need to watch the master devour chicken or talk about meat to know that he is a hungry guy. Hello - we get it. And why add those two people who want immortality - huh ? A totally wasted show in my opinion. I would rather have re-watched the Library episodes. Now they were good. 'Bout what I suspected. Tennant and Cribbins are all kind of awesome. Davies is great at character moments, and the show's overall mythology, but gets a little clunky when he tries too hard for the epic "My God, it's the end of everything we know"-type grandeur. Plus, John Simm, an actor I do like, nevertheless just chews the scenery shamelessly as the Master. (Why couldn't they have kept Derek Jacobi? For the 5 minutes he was The Master, he was ten times scarier.) And it's hard to rate an episode that was mostly set-up without seeing the episode that it's setting up. Me, I can hardly wait. First off, nobody who's watched Torchwood or Who for the last five years or so will ever accuse RTD of having a sophisticated understanding of politics (American or otherwise); even the Master's "Mr. Saxon" was such an obvious riff on Tony Blair that it was cringeworthy, and that was in the hands of a far better actor (Simm) than Who ever casts as an American. Obama à la Davies at least wasn't a "stupid ugly American" stereotype like RTD's past broad-brushed attempts to lampoon Bush 44, at least. Speaking of Americans, newscaster "Trinity Wells'" glaringly bad Standard American is all the more frightening since the actress appears to be American herself. Why she insists on mispronouncing words like "edict" (ed dict?) and "Barack" (rhyming with Iraq?) is beyond me. Someone should sit the actress down with Barrowman for remedial diction training. Onto the episode itself... the Wilf stuff, the Ood stuff, and the Dalton/Time Lord stuff was good. The reincarnated Master is a bit hokey and over the top. RTD of course wheels out the rich daddy and daughter (with zero background, of course) to bludgeon us over the head yet again with the idea that all wealthy people have more money than sense when it comes to alien technology. The green scientists are there because I guess we need some forehead aliens. I enjoyed it mostly because I think Tennant could make reciting a phone book enjoyable. All I can say about the second part is that I fear the Giant Reset Button yet again rearing its head in part 2. So far it seems to me that RTD should have just handed over the reins to Moffat after Waters of Mars (or even the S4 finale), if only so we could see what Moffat could do with Tennant. I was shocked to learn in the Confidential that the actress playing Trinity Wells was American. I had assumed that she was another Brit with a bad American accent. (See the blond haired CIA agent on Spooks/MI-5). Overall assessment: mine, like some others have said, is that I reserve final judgment until I see the second part. This one does get better for me with each successive viewing (3 and counting so far), but judged solely on its individual merits it wasn't top form for me. What I loved: Tennant, Cribbins, and Simm. I disagree with what you call Simm's "chewing of scenery". It'd be too simplistic to say the Master is the anti-Doctor, but they are sort of exact polar opposites, so I see that chewing scenery as the Doctor's showmanship and flair just twisted to a megalomaniacal degree. I loved the eating scenes because they showed a man who fancies himself the master (unintentional pun) manipulator just driven to a place of undignified, animalistic, desperation. When he's given the opportunity to tip the scales with the Immortality Gate, he promptly does so and regains his footing. What I liked: the return of the Time Lords. That cliffhanger set the stage for the Part 2 and I've been waiting for more of a resolution to the Time War backstory than the Doctor's "They all died, I don't really wanna talk about it." line that he's given us up to this point. What I didn't like: The gimmicks. RTD's detractors have long accused him of using magic and shortcuts to advance plot or account for things without further explanation (the Doctor's frequent sonic screwdriver use is a popular target for this). I've never really bought into any of that up to now, but it was contradictory to say the Master is "burning up his life force" and "his body is ripped open" while at the same time imbuing him with unnecessarily superhuman (I know, he's NOT human...superalien if you like) powers. The Simm and Tennant interaction is some of the strongest stuff, but it's like there's a timer in RTD's head for how long they can co-exist on screen together without exploding (a concept I don't agree with...the Doctor wants to save the Master, the Master wants to see the Doctor suffer--neither wants to get rid of the other), so he has to come up with an extraordinary way to keep them moving (Jack's teleportation device the first go round, the Master's Heroes-esque powers this time). Also, the Joshua Naismith character was a one-dimensional weirdo with poor backstory. David Harewood tried to elevate it...but he deserved better from his writer on that one. What I hated: the Obama reference. As someone else alluded to, Who has generally avoided using real-life political figures in the past...and I get that there was big to-do about Obama when this was probably written, but really?? I mean, I don't wanna read too far into it because the whole thing boils down to another gimmick so that we can drive home the point that the Master is now standing where only seconds ago there was a prominent world leader, but it came off as more comical than anything. Farce comedy too, as for me, the laugh came when I had the thought that the Master's intervention spared me yet another Obama speech (sorry, not making a political statement, just...the man does like his TV time). For all the flaws of TEoT #1, I'm not sure I can agree with people who say that Russell T Davies can't write. He wrote the searingly brilliant 2-part miniseries The Second Coming as well as Torchwood: Children of Earth, as well as more than a couple very good Who episodes. But what I really like about this is how much alike they are: both The Doctor and The Master are seriously broken -- the "Time Lord Triumphant" who still in denial about what a bloody mess he's made of things by arrogantly deciding that Time would submit to his will... and The Master? Well, the elegant manipulator who always operated in the shadows, always a step ahead of everyone else is gone. And I don't think either quite realise that they're little more than pawns in a larger game. Ironic that if there was a speech by the President around Christmas it would have been about health care. I agree 100 billion per cent with J. This was worse than those freaking Daleks in Manhattan episodes! Nobody spits their lines better than Timothy Dalton. @Karen: It's not that RTD can't write, it's that he's not a very good sci-fi writer (his best DW scripts have been the simpler ones, or co-written with someone who understands sci-fi), and that he's terribly inconsistent. He clearly overstretched and overworked cranking out the majority of DW episodes, and the show has suffered. What's more annoying is that he often has some very good basic ideas, but overloads them with so much silliness that they quickly become irritating "everything-and-the-kitchen-sink" indulgences. For all those who hated this episode, I challenge you to write a script and send it to the BBC. Yes, RTD has his faults - Obama didn't seem much point but it was a plot device to get over the point the whole world had changed. To make a reasonably flowing story, you need plot devices to get over the bit that's a bit pointless (Master resurrection) to get to the bit of the story you really want to tell. The immortality gate I think was another short-cut "plot device", but bear in mind that the real baddies in this, the Timelords themselves, are aware that the Doctor will wipe them and the Daleks out at the end of the Timewar and (as per the voiceover) have put in place events that seem random (the gate falling into the Masters hands) but are actually part of their plan to survive. The whole point is that destiny is just that, and things that seem random and pointless, are not. Finally, Wilf and Doctor = really good, Doctor and Master in wasteland = really good (IMO I wish there would be more of this Batman - Joker type thing where neither will actually kill the other, both are rebelling against the TimeLords and their policy of non-interference (established way before Star Trek's prime directive of TNG), and each is the mirror image of the other.... as RTD tried to show both times they have fought each other. Not sure the superpowers worked though, but maybe it has a reason in Part 2. It could just have been to show how the mighty (a powerful Timelord) has fallen (tramp needing lots of food to replace the energy his body is leaking as the resurrection went wrong..... as well as a less than obvious commentary on Christmas gluttony. Okay, can we please retire this extremely tired and pointless rebuke to any criticism of anything? One doesn't need to be a barber to be able to recognize that their friend got a bad haircut, you know? I take your point Alan, but some of the criticism is quite extreme. "If the point of this episode was to make me wish Tennant and Davies gone, than mission accomplished. I want everyone involved with this "special" to die in a fiery bus crash." It was a fun piece of television (and uncut by BBCA, btw). A tad busy perhaps, but I'd rather have a little too much than too little. Some of the complaints about the plot say more about the lack of comprehension skills of the complainer than anything else. The problem with taking criticism of Doctor Who seriously is that there are extreme fans with very specific ideas of what Doctor Who is supposed to be. Nothing could ever live up to their expectations. And the vitriol directed at RTD and Tennant is sickening. That aspect of fandom makes all of us look crazy. Some of the complaints about the plot say more about the lack of comprehension skills of the complainer than anything else. Wow. Did you just call me stupid? While I take issue with certain parts of this episode, I certainly think wanting to put anyone involved in a fiery bus way too extreme. It's just a show, however, the sloppiness of the episode, and the realtively weak specials over the year do seem to show that RTD is running out of steam, and that he may have been better off ending it after season 4. 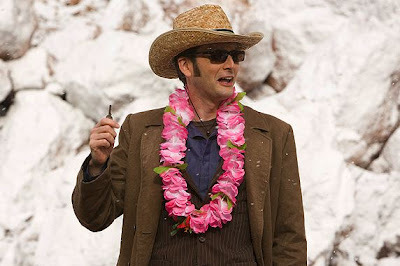 Remember the awesome cliffhanger when we thought Ten was going to regenerate? That was a part one that didn't have people thinking WTF. The ratings for this year's Christmas special are also down in the UK compared to the last, so I believe we can safely say that there were some flaws in this episode. Although there were good parts, mostly with Wilf and the return of the Time Lords, I was disappointed because the end of Waters of Mars had created a great feeling of dread and suspense, which completely dissipated with the bouncing Master. And, we know that RTD can write great stuff because the Torchwood Mini-Series was spectacular. okay, let's all calm down. Remember: talk about the show, not each other. Honestly, I liked this one a lot better than the Waters of Mars. I can't understand why people liked that one so much. Yes, this one had significant flaws, but was just much more interesting than waiting around for people to die a horrible death. There are a lot of things thrown into this one that just seemed underdeveloped. What's with this cult that wants to restore the Master? And presumably a counter-cult that wants to destroy him? Where did they come from? All of that seems just sort of thrown in there as an excuse to get the Master back, and then it's discarded. Yes, the super-powered Master was also out of nowhere. What's the deal with that Naismith guy and his daughter? How did they come to be obsessed with immortality, and apparently specifically immortality for her rather than him? And what made them think this thing would give them immortality? And who are these aliens who are fixing the machine for him, yet apparently don't understand what's going to be done with it? Maybe some of this will be addressed in Part II. But it was just a lot more interesting than what seemed like the inevitable deaths in Waters of Mars. The parts dealing with the Doctor's conflicted feelings about his own coming death, his conflicted relationship with the Master (the last member of his own race, with whom he has a long history), etc., I liked a lot. And the ending with the return of the Time Lords... WOW! (and it certainly doesn't hurt that Timothy Dalton was their leader!) Looking forward to seeing how this all ends. FYI: I was looking back at some YouTube clips of prior regenerations, and yes, it does seem like the Doctor is nervous about the whole process, though as someone else said, he usually dies rather suddenly and doesn't have a chance to think about it. The original series didn't much talk about the Doctor's feelings about anything, and one of the interesting things about the new series is that they do address that sort of thing. To be quite blunt, compared to the POS that is Stargate: Universe and FlashForward, or even V (which, IMO, has a lot of unrealised potential) Doctor Who has been well ahead of the SF TV curve this year. You're entitled to disagree, but please don't anyone call me "stupid" just because I've got a different POV. I was disappointed because the end of Waters of Mars had created a great feeling of dread and suspense, which completely dissipated with the bouncing Master. OK, I can see where you're coming from and respect that, but I think I've got a slightly different POV because I've been watching the show for over thirty years. 1) Remember the show is going out in the UK at 7pm on a Saturday evening, and is meant to be reasonably "family-friendly". You're not going to get an episode of Dexter or even BSG here. There is an element of panto involved, and while that may not be to your taste it's a reasonable way to deal with the practical considerations of the time slot and the target audience. 2) It did creep me out, because in the context of the show's history, The Master may have always been mad as a sack of hair but never that far out of control. Anyway, the other Time Lords have always found the Doctor's fondness for lower lifeforms like humanity rather odd. The Lord President of the Time Lords certainly doesn't give a damn that The Master effectively wipes out the human race in an instant as long as it serves his grand design, so why should he treat Christmas with anything but condescension as the primitive attempt of hairless apes to hide from the dark? There are a lot of things thrown into this one that just seemed underdeveloped. What's with this cult that wants to restore the Master? And presumably a counter-cult that wants to destroy him? Where did they come from? All of that seems just sort of thrown in there as an excuse to get the Master back, and then it's discarded. Serious question: At what point do you load so much backstory in that you stop telling the story and it all melts into a giant puddle of fanwank? Seriously, I don’t care where the Cult of Saxon came from — or where Lucy got enough of a spine from to die a heroic death. They serve a plot function to bring The Master back and break him. Did anyone else notice how similar the Immortality Gate was, in plot purpose, to the Chula "Ambulance" from "The Empty Child"? Interesting points, but I agree with Craig and others in that the point of the story is not the cult of saxon, but that the Master is back. A little WTF? yes, but does it really matter in the context of the overall story? Probably not. Oh, I have a funny feeling that The Master is going to be severely underwhelmed when he finds out that he's just a pawn in the "greater events" promised by the Fourth James Bond in his closing monologue. (And I don't know about anyone else, but I don't think John Simms was brining all the crazy there.) He's far too used to being the puppetmaster to every quietly submit to being a puppet. Again, I came to the character as a newbie with Russell T. Davies and Christopher Eccleston, but when I asked in the past (particularly around "Journey's End") about how The Doctor usually reacts to the idea of death and regeneration, I was told it usually happens so suddenly that he doesn't have time to show any emotion at all. So Davies has created a relatively unusual circumstance for his leading man to play on the way out the door. The 4th Doctor, Tom Baker, was aware of his impending death as well. He started having strange feelings and then spotted a mysterious Watcher. After a private conversation with the Watcher (away from his companions), he goes into his final story and stops the Master's plan to destroy the universe. He dies in the process and it is revealed that the Watcher was actually an incarnation of himself -- between the 4th and 5th Doctor -- that he sent into the past to warn him of what was coming. @Chris Lawrence: "with Barrowman for remedial diction training." Like when Captain Jack said eeeeestrogen? That always bugged me. Enough snarking, I don't disagree that it was busy, but it felt like a good set up. It's hard to judge part one of anything without part two, so I may end up hating it--who knows. I thought the Master's hunger/powers were thanks to Lucy's botching of the resurrection process before it could be completed. The Obama stuff was odd, but for a British audience, perhaps less so, or at least different. Still looking forward to see where this all ends up on Saturday. I completely didn't get the joke until I read it on another message board, but at the beginning of the episode The Doctor says he married "Good Queen Bess" and that it was a mistake. Good Queen Bess is Queen Elizabeth I, who the Doctor met in The Shakespeare Code, where she said The Doctor was her sworn enemy and he said he looked forward to finding out what he did to make her angry. Props to RTD for paying off a joke 3 years later, it was almost The Wire like. The CIA agent with the horrible American accent is named Sarah on the show and was in the most recent Spooks series (the one with Richard Armitage). Christine was on much earlier when Matthew MacFayden was still on the show. (and nothing sounded off with her accent). Nicknamed the Accent on the TWoP boards, her speech patterns travelled from Boston to Texas in one sentence. @Anon:Props to RTD for paying off a joke 3 years later, it was almost The Wire like. What midly shocked me about that was that RTD made a, well... rather blue pun on The Virgin Queen at tea-time on Christmas Day. Though, I'm pretty sure it went over the heads of the kiddies at warp speed.